Demolition of the long-abandoned Ocean Plaza Mall, formerly sandwiched between Rose’s and ACME in the 94th Street bayside shopping plaza, began around this time last year. Now the ground has been leveled, and in the old mall’s place is just a gravel lot and a chainlink fence. It’s a blank slate. Rose’s and ACME remain open, and there hasn’t been any news of what might replace the old mall since its demolition. 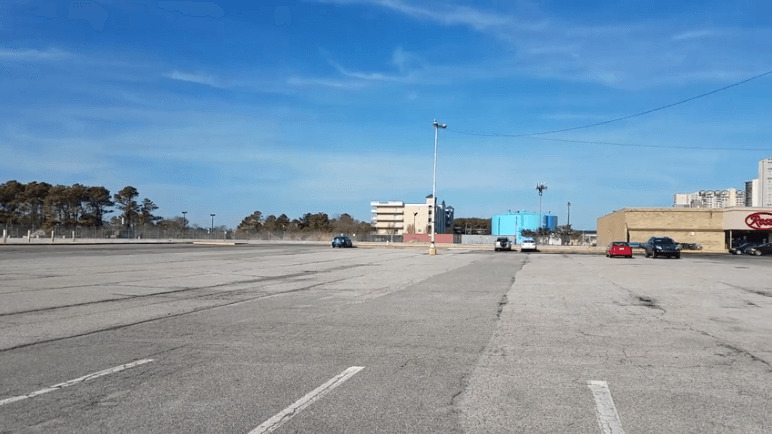 We drove by the site on Wednesday, Feb. 6, and took a quick Facebook Live, asking, “What would you like to see the old mall on 94th street become?” We received 158 comments in response. The general consensus on Facebook seems to be that no one wants a chain restaurant or hotel (for the most part), and that most people would like to see some kind of entertainment complex or green space. Our friends on Facebook are a creative bunch. What would you like to see in the 94th Street Plaza? We need jobs in this area!! Year-round ones!! Something like yes an aquarium and animal rescue. I believe this would really benefit OUR HOME TOWN!!!! I have heard that a Cracker Barrel restaurant is coming to 94th street plaza. Is this true?